AFTER MANY YEARS OF PRIVATE SERVICE, WE WERE OFFICIALLY LICENSED FOR BUSINESS IN 1990. 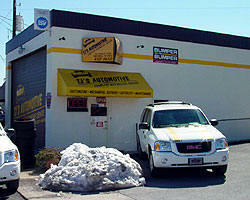 STARTING OUT IN A TWO-CAR GARAGE, WE EXPANDED TO A TALL FOUR-STALL GARAGE IN 2003. THIS WAS DONE TO ACCOMMODATE THE VARIETY OF VEHICLES WE SERVICE, THOUGH THE NEED FOR FUTURE SPACE IS ALREADY EVIDENT. GET NAME BRAND COOPER TIRES WITH THE BEST NATIONAL TREAD WEAR WARRANTIES. ALWAYS CUTTING EDGE WITH NEW TIRES TO OUTPERFORM THE REST. WE RECOMMEND THEM OVER ANY COMPETITOR FOR QUALITY AND PRICE. WE USE FACTORY NEW (OEM) PARTS WHEN REQUESTED OR IF THE ONLY SOURCE. OUR MAIN NON-OEM REPLACEMENT SOURCE IS THE NATIONALLY RECOGNIZED COMPANY KNOWN AS "BUMPER TO BUMPER". THEY ARE ALSO KNOWN AS "AUTO VALUE", AND DELIVERED TO US BY THE LOCAL SUPPLIER "AUTOPARTS WAREHOUSE". I AM SURE YOU HAVE SEEN AT LEAST ONE OF THEIR DOZENS OF CARS ZIPPING AROUND. THEY SUPPLY US WITH NATIONALLY KNOWN BRANDS YOU CAN TRUST. THIS COMPANY AND THESE BRANDS CAN BE FOUND EVERYWHERE YOU MAY TRAVEL, IF YOU WOULD HAVE ANY TROUBLE. HAVE A USED CAR WARRANTY? WE HONOR MOST WARRANTY COVERAGE, BILLING SUBJECT TO YOUR WARRANTY TERMS. PLEASE UNDERSTAND WHAT YOUR WARRANTY COVERS SO YOU GET NO SURPRISE AND KNOW WHAT TO EXPECT. ALL ARE BASED ON A TIME TERM AND MILEAGE, WHICH EVER COMES FIRST. WARRANTIES DO NOT COVER NORMAL WEAR ITEMS. THOSE ARE THINGS LIKE TIRES, BRAKES, BULBS AND MAINTENANCE TO NAME A FEW. MOST COVER ONLY MAJOR POWER TRAIN FAILURES, WHICH ARE INTERNALLY LUBRICATED ITEMS, LIKE THE MOTOR, TRANSMISSION OR TRANSAXLE, TRANSFER CASE AND REAR END DRIVES. MOST DO NOT COVER SEALS OR GASKETS (AND MAYBE NOT FAILURES DUE TO THEM BEING THE CAUSE). ONLY SOME COVER ELECTRICAL PARTS. NOTE THAT SOME DO NOT PAY FOR THE DIAGNOSIS. WE ARE A PREFERRED SHOP FOR GUARDIAN WARRANTY CORPORATION, WHICH MEANS EASY DROP OFF, DIAGNOSIS AND TIMELY RESPONSE FOR YOUR COVERED VEHICLE. ALL WE ASK IS YOU CALL YOUR WARRANTY COMPANY FOR ANY QUESTIONS YOU MAY HAVE FIRST AND SET UP A CLAIM NUMBER FIRST IF POSSIBLE. HAVE AN OLDER CLASSIC CAR, OR JUST PERSISTENT TO USE R12 FREON. WE HAVE A LIMITED SUPPLY TO RECHARGE YOUR VEHICLE. WE CAN ALSO RETROFIT TO R134A. WE CAN TAKE CARE OF YOUR MAINTENANCE, MECHANICAL REPAIRS, COLLISION REPAIRS AND EMISSION & SAFETY INSPECTIONS. WE CAN HONOR MOST AFTERMARKET WARRANTIES ON YOUR VEHICLES. COME SEE WHY WE ARE THE FASTEST GROWING LOCAL SHOP. I BET YOU WILL AGREE WITH ALL OUR CUSTOMERS WHO STATE WE ARE THE CLEANEST SHOP THEY EVER SAW. THAT IS BECAUSE WE RESPECT EVERYTHING WE TOUCH, AND ESPECIALLY YOUR VEHICLES. IT HAS ALWAYS BEEN OUR STRIVE TO CONTINUALLY BUILD THE SERVICES WE PROVIDE TO OUR CUSTOMERS. IT HAS ALWAYS BEEN OUR GOAL TO DO ALL WORK YOUR VEHICLE WOULD NEED IN ONE PLACE. IT IS OUR INTENTION TO DO ALL THE BEST SERVICE FOR OUR LOYAL CUSTOMERS, NOT JUST TO SERVICE ALL AVAILABLE CUSTOMERS. BECOME ONE TO LET US TAKE CARE OF YOUR AUTOMOTIVE NEEDS. CHECK OUT OUR PICTURES AS WE POST THEM. TRUST .... IS A BIG WORD, AND YOU HAVE IT HERE. UNLIKE OTHER EXPERIENCES YOU MAY HAVE HAD, WE ARE NOT IN THE BUSINESS OF SCAMMING YOU OUT OF YOUR HARD EARNED MONEY. WE BELIEVE ONCE YOU STOP BY FOR A SERVICE, YOU WILL LIKE TO STAY WITH US. WE OFFER TRUE PERSONAL SERVICE. YOU WILL TALK TO THE SAME PEOPLE WHO WILL WORK ON YOUR VEHICLES. WE WANT TO THANK ALL OUR APPRECIATIVE AND FAITHFUL CUSTOMERS WHO HAVE ENJOYED OUR HONEST SERVICES THRU ALL OUR YEARS. 22 YEARS NOW!! DESPITE THIS FOUL ECONOMY. ASK ABOUT "TJ'S ECONOMIC STIMULUS PLAN" SAVE 10% OFF YOUR LABOR SERVICE. ASK FOR THE DETAILS. HAVING CAR TROUBLES? WE ARE CAR DOCTORS. LET US DO THE DIAGNOSIS AND FIX IT RIGHT, LIKE YOUR FAMILY DOCTOR DOES. BRING YOUR CAR IN FOR A CHECK-UP OR QUOTE. IT NEEDS US IN PERSON TO CHECK IT OUT. SIMPLY SAID, QUOTES ARE FREE, AND NOT POSSIBLE OVER THE PHONE. DIAGNOSTICS ARE REASONABLY INEXPENSIVE. NO QUOTE CAN BE DONE WITHOUT INSPECTING OR DIAGNOSIS. HOW COULD ANYONE KNOW WHAT IS WRONG AND NEEDS FIXING? PLEASE DON'T KID YOURSELF OR US, THE PARTS STORE DIAGNOSIS AND ON-LINE SOLUTIONS ARE WORTH NO MORE THAN USED TOILET PAPER....LOL. REMEMBER, IF THEY CLEAR THE CODES, YOU JUST LOST ALL THE VALUABLE DATA ANYONE NEEDS TO FIX IT AT ALL. WE ARE HAPPY TO SERVICE REFERRALS FROM GUARDIAN, WYNN'S & ENTERPRISE WARRANTY COMPANIES NOW, ALONG WITH ALL OTHER WARRANTIES. MMMM.... SOME PEOPLE LIKE TO TAKE THEIR CARS TO THE DEALERS. GREAT FOR WARRANTY CONCERNS, BUT OTHERWISE, THEY MUST HAVE ALOT OF MONEY THEY DON'T WANT. SOME ARE FANS OF CHAINS STORES...GREAT. I LIKE TO USE THIS COMPARISON ABOUT US. CHAIN STORES CAN MAKE AN EDIBLE HAMBURGER, BUT ONLY THE LOCAL GUY CAN MAKE AN AWESOME ONE. YOUR CAR WOULD APPRECIATE NOT BEING ALWAYS FED SUB-PRIME FOOD TOO!! IN THESE CRAZY DAYS OF BAD FUEL EFFICIENCY, AND THE ECONOMY BEING POOR, WE CANNOT STRESS MORE THE BENEFITS OF MAINTENANCE TO STRETCH YOUR FUEL EFFICIENCY, AND MOST IMPORTANT, MAKE THAT CAR LAST LONGER! IT WILL PAY FOR ITSELF MANY TIMES OVER. CHEAPER THAN A NEW ONE. ASK ABOUT THESE SERVICES. FOOD FOR THOUGHT; I KNOW MOST PEOPLE THINK CARS ARE A BIG WASTE OF MONEY, OR AT LEAST YOUR SECOND BIGGEST EXPENSE. THAT ALONE SHOULD CONCERN YOU TO TAKE CARE OF IT AS BEST YOU CAN. WE DON'T LIKE TO PASS ON BIG REPAIR BILLS, BUT YOU NEED TO MAINTAIN YOUR VEHICLES TO AVOID THEM. WE ARE HONEST AND FAIR IN OUR SERVICE. JUST COMPARE US TO THE BOTTOM LINE. NO BILL PADDING HERE. MY COMMENT TO YOU ABOUT CAR EXPENSE IS; HOW CAN YOU DEAL WITHOUT YOUR CAR? IS IT NOT FRUSTRATING WHEN IT BREAKS DOWN? CAN YOU AFFORD TO BE WITHOUT A CAR? IS IT NOT A REAL PAIN TO NOT HAVE YOUR CAR A SINGLE DAY, MUCH LESS A WEEK, OR EVER? WE ARE DEPENDENT ON OUR CARS FOR OUR FUN TIMES, AND MOST IMPORTANTLY TO GET TO WORK TO PAY FOR EVERYTHING WE HAVE. THAT IS WHY IT IS IMPORTANT TO MAINTAIN YOU CAR TO KEEP IT ON THE ROAD, AND GET IT FIXED AS QUICKLY AS POSSIBLE WHILE DONE RIGHT. WE CAN KEEP YOU MOTORING HAPPILY. AS ALWAYS, WE LOOK FORWARD TO SERVING YOU IN 2012. 22 YEARS HERE ! WE ARE A SINGLE, FAMILY RUN BUSINESS. BUT WE ARE A VERY VERSATILE REPAIR SHOP AT YOUR SERVICE. DON'T LET OUR SIZE FOOL YOU. WE CAN PERFORM MANY SERVICES OTHERS CANNOT AT THE VERY BEST IN PRICE. NO COME-ON'S OR SALES GIMMICKS HERE. WE ARE HONEST AND STRIVE TO BE VERY QUALITY ORIENTED. NO CHEAP BULL. WE USE TOP BRANDED PARTS. IF YOU WANT THE BEST IN SERVICE FOR THE PRICE, GIVE US A TRY TO PROVE IT. WE WANT YOU, OUR CUSTOMER'S, TO APPRECIATE WE DON'T STRIVE TO BE THE CHEAPEST, BUT WE DO INTEND TO OFFER THE BEST FOR THE MONEY. WE ALWAYS INVEST BACK INTO MAKING US BETTER FOR YOU. PRICE COMPARE US, AND SIMPLY PUT, WE WILL BEAT THEIR BOTTOM LINE WITH THE BEST OF PARTS. GET THE JOB DONE THE RIGHT WAY, THE FIRST TIME. CHEAP WORK IS CHEAP, THE BEST JOB IS WORTH IT! AS ALWAYS, WE ALWAYS LOVE NEW CUSTOMERS. WE WILL TREAT ALL CUSTOMERS WITH THE SAME, BEST OF RESPECT, AS ALL OUR CURRENT REPEAT CUSTOMERS. DO BE AWARE, WE, AS ANY OTHER BUSINESS OR PERSON, WORK FOR MONEY. IMAGINE YOU SPENDING A WEEK, EVEN A DAY FOR YOUR JOB, AND NOT BEING PAID. WE DO ALL OUR WORK FOR WHAT I WOULD CALL THE BEST JOB FOR A FAIR PRICE. PEOPLE WHO SHOP JUST FOR THE CHEAPEST PRICE, OR JUST WANT THERE CAR FIXED FOR A FEW DOLLARS, DON'T DO ANYBODY ELSE ANY RESPECT, AND THEREFORE NOT WHAT I WOULD CALL A CUSTOMER. EVER, "HEAR" OF THE JOKESTER WHO SAID "JUST LICK AND STICK MY CAR. NOTHING IS WRONG WITH IT." BEST PART IS THE HEAP THEY CAME IT WITH. SORRY, NOT HERE. I RESPECT LIVES OF ALL OTHER PEOPLE MORE. SAFETY FIRST! WE LOVE PEOPLE WHO LOVE THEIR CARS! READ THIS MORNING CALL STORY CALLED "SHOW MECHANICS GRATITUDE FOR KEEPING OUR CARS MOVING"